The statistical nature of the ionizing process during the passage of a fast charge particle through matter results in a large fluctuations of the energy loss (Δ) in absorber which are thin compared with the particle range. The number of electron-hole pairs (J) is related to Δ by the expression J=Δ / P, where P is a proportional factor, for the silicon equal to 3.68 eV. Both Δ and J are stochastic quantities. The probability function f(Δ) and φ(J) are usually called energy loss distribution or straggling function. They may be characterized schematically by the position of the maximum of distribution function (Δp) and the full width at half maximum (w). 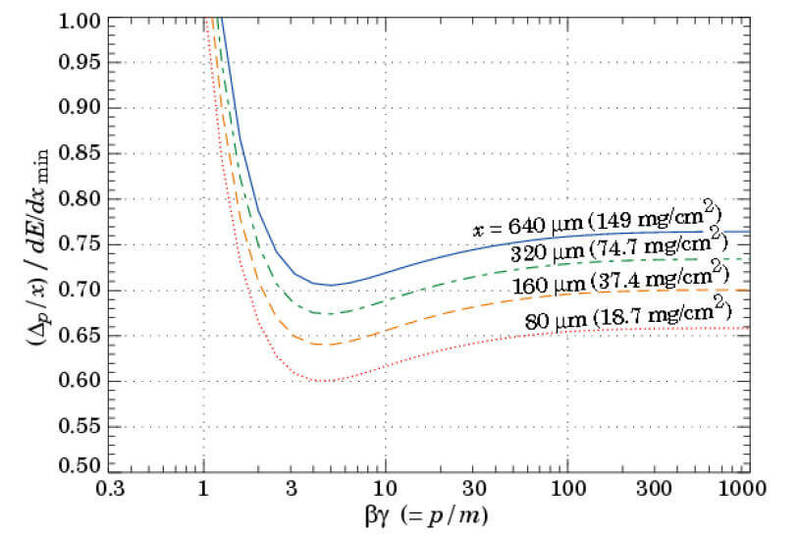 The Δp is located at lower value compared to the mean energy loss obtained from Bethe-Bloch ‹Δ› (Fig.1). (click here to download the C++ Bethe-Bloch calculator). 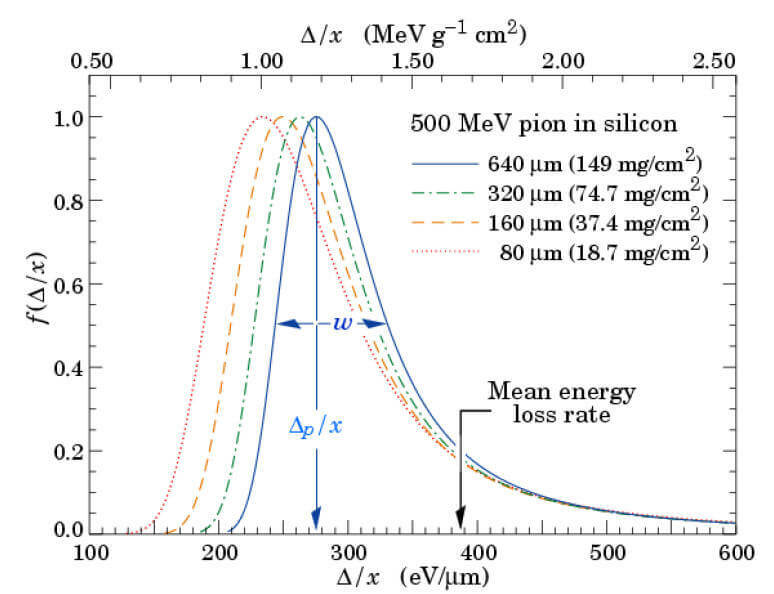 Fig.2 Stopping power for positive muons in cupper Straggling functions in silicon for 500MeV pions, normalized to unity at the most probable value Δp/x . The width w is the full width at half maximum. Fig. 3 Most probable energy loss in silicon, scaled to the mean loss of a minimum ionizing particle,388eV/μm (1.66 MeVcm2/g). Landau-Vavilov solutions have been derived under the assumption that scatterings occur on quasi-free electrons. Therefore they neglect the electron binding energies. This assumption is a valid approximation only for close collisions. Further corrections to the theory taking into account the fact that the electrons in the material are not free have been attempted by Blunck and Leisegang , Shulek  and Bichsel . As the material thickness decreases, δ2 becomes more and more the dominant term, which determines the overall w of the straggling function. Conversely, it is not expected to provide an additional broadening of the distribution at large thicknesses. As an example, in 300 μm thick silicon detector we get ξ is ~ 5.34 keV, √(δ2) is ~ 5.76 keV, and an overall w is 25.4 keV (i.e., 18% larger than Landau width) for a relativistic β~ 1 and z = 1 particle in agreement with the experimental data. L. Landau , On the Energy Loss of Fast Particles by Ionization, J. Phys. USSR 8 (1944) 201. Particle Data Group PDG, Passage of particles through matter, Nuclear and Particle Physics, vol. 33, no. 27, pp. 258-270, July 2006. P.V.Vavilov, Ionization losses of high energy heavy particles, Soviet Physics JETP, 5:749, 1957. Blunck and S. Leisegang, Zum Energieverlust schneller Elektronen in d�nnen Schichten, Z. Physik 128 (1950) 500. P. Shulek at al., Fluctuations of Ionization Loss, Sov. J. Nucl. Phys 4 (1967) 400.